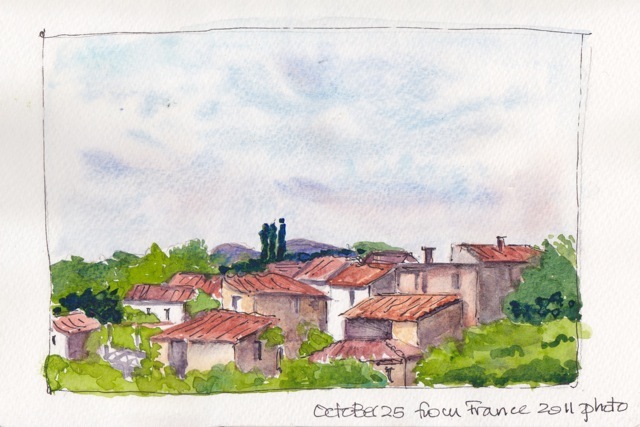 I took a watercolour class in October on painting the buildings and landscape found in the south of France. 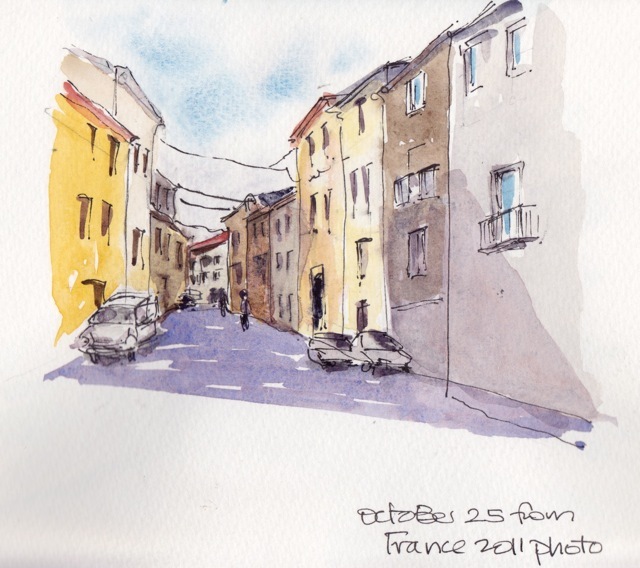 We were to use photos we have taken ourselves and try to capture the essence of the buildings and streets in loose sketches. 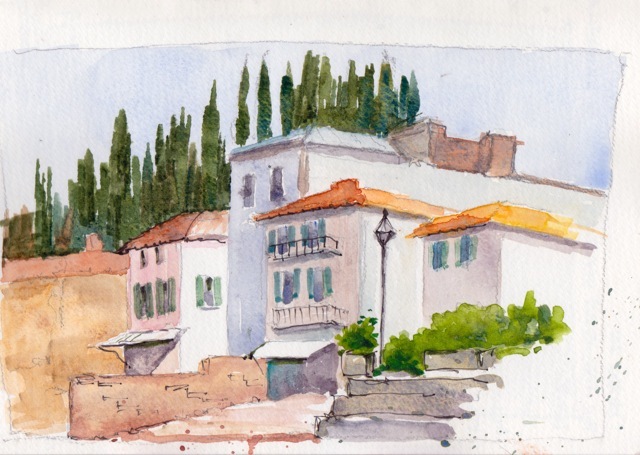 The first sketch is my version of an example the teacher provided; the rest are based on my own photos from a 2011 trip I took to the village of Limoux. 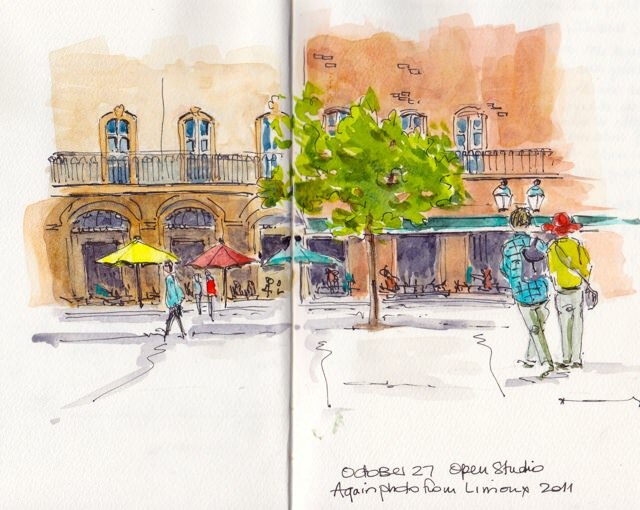 Sketching these was a reminder of the beauties of the area and also an antidote to the cold and rain we have been having in Ontario. 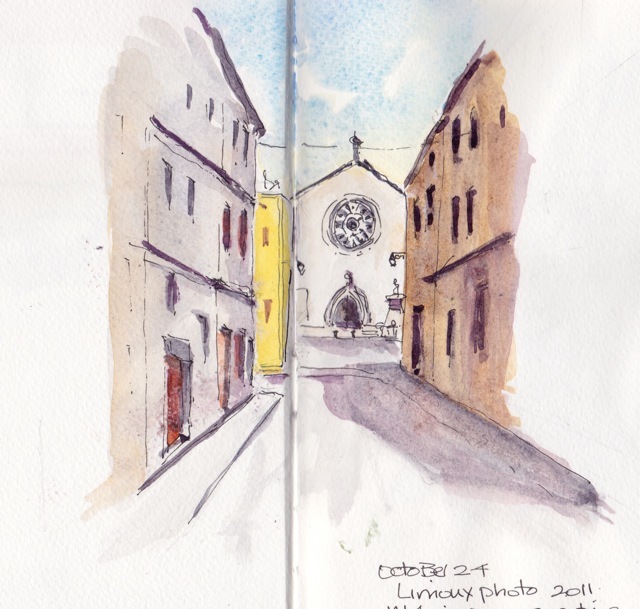 And, good news: I am lucky to be going back to Limoux again in the spring for two weeks of sketching. It began here and as it goes with these things, it’s been a long while in the making. Many loops pulled, my thoughts thought. I think this Annie Dillard quotation is a good one to remember and I will enjoy having this rug underfoot, a part of our daily life. The Gallery 121 show is coming up. It begins on November 2nd and the formal opening is November 5th 2-4 pm. 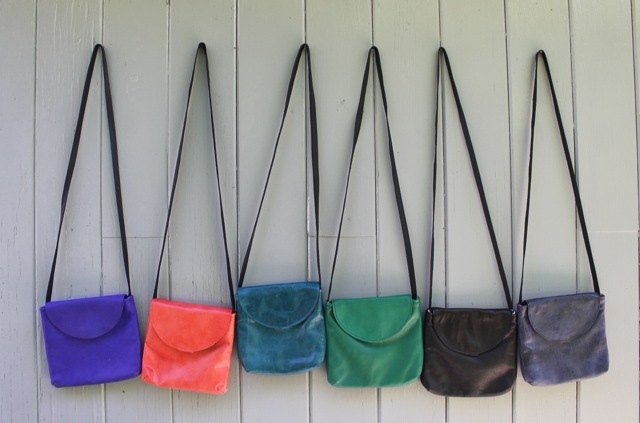 Yesterday in the sun, I lined up the small shoulder bags I have designed for the show. I call them G121. 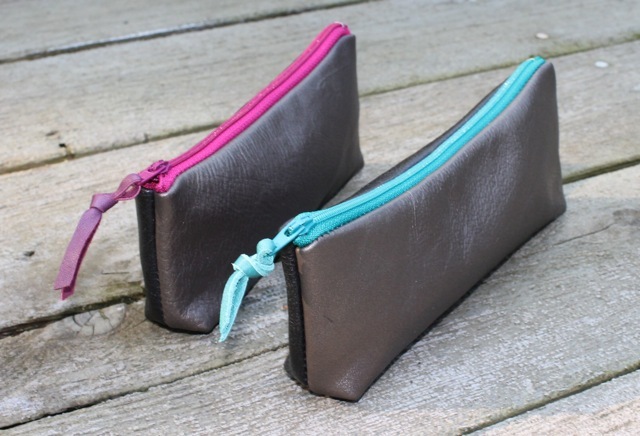 They are a simple leather day bag with a flap and magnetic closure. Some have pockets on the back and they all have a pocket inside. This is the bag you would take out to the show or for dinner. 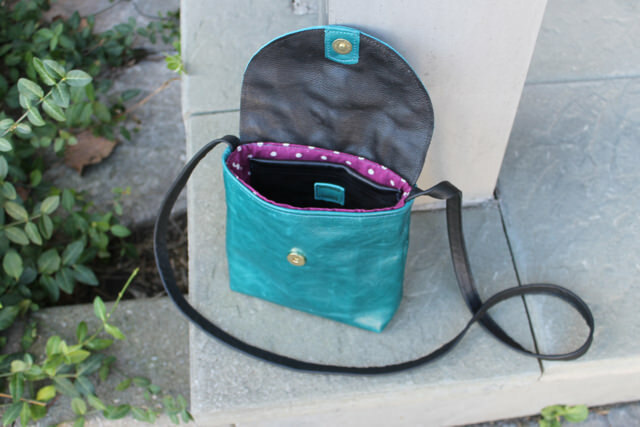 It has ample room for all your essentials and just slings over your shoulder. 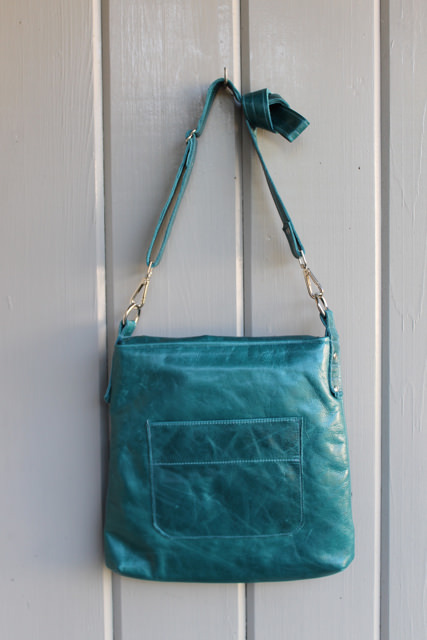 It is designed to be worn hands-free, cross-body, but the leather strap can easily be knotted to shorten. 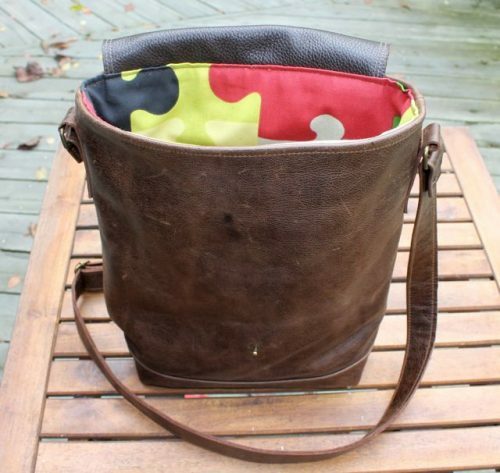 The bag measures 9.5″ wide and 8.5″ tall with a two inch bottom. Carissa has been road-testing one all summer, and she tells me she can even fit her small water bottle in it. I think they are a fun and useful boost of colour in your life. 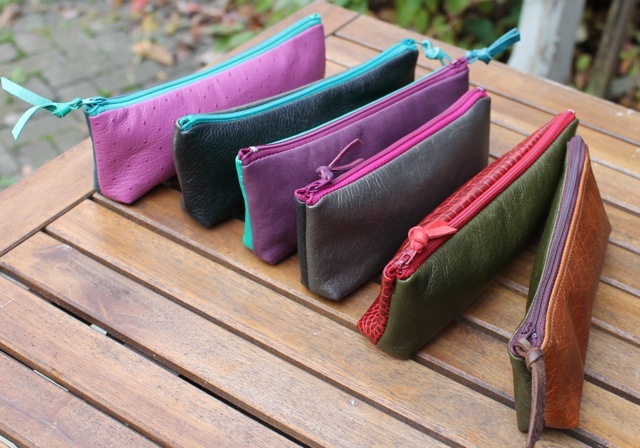 I have lots of fun making these little rectangular pouches from my favourite leather remnants and colourful zippers. They are great for your sunglasses or pens. 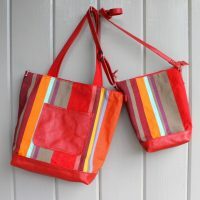 The bright colours ensure that you will find them in a crowded tote. These will be available at the Gallery 121 show, but if you can’t make it and would like one, just write to me with your colour preferences. They make great affordable gifts! I wanted to make a daily tote. The one you rely on to carry all your stuff on busy days. The one that looks good everywhere and wears its age well. 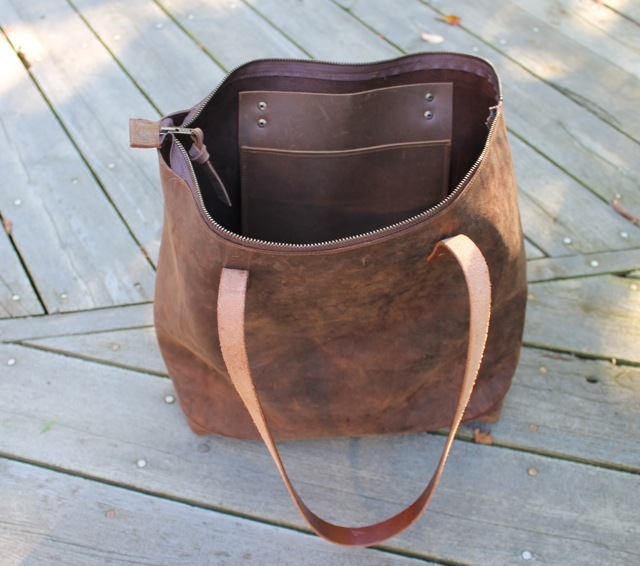 I had this great mocha leather which was just enough to make this tote, 12.5″ wide, 12″ tall with a double base of 4″. 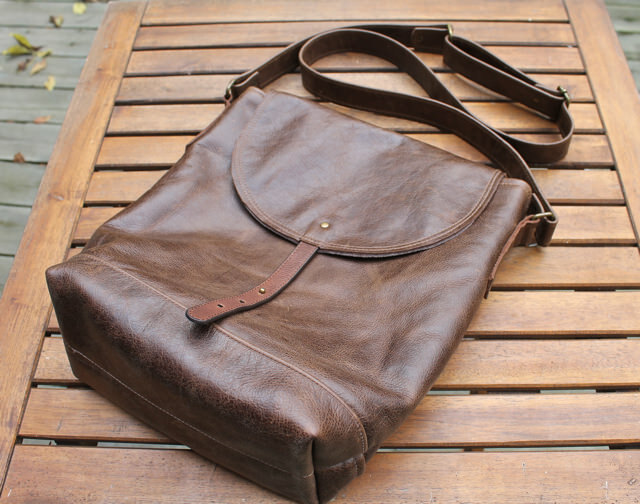 There is an adjustable leather strap, subtle brass coloured hardware and a back pocket with a sturdy metal zipper. 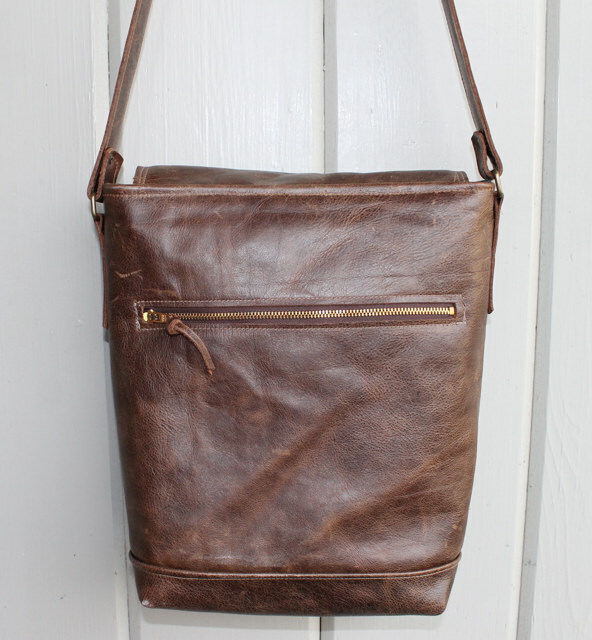 The front flap is double leather and closes with a leather strap and brass knob. 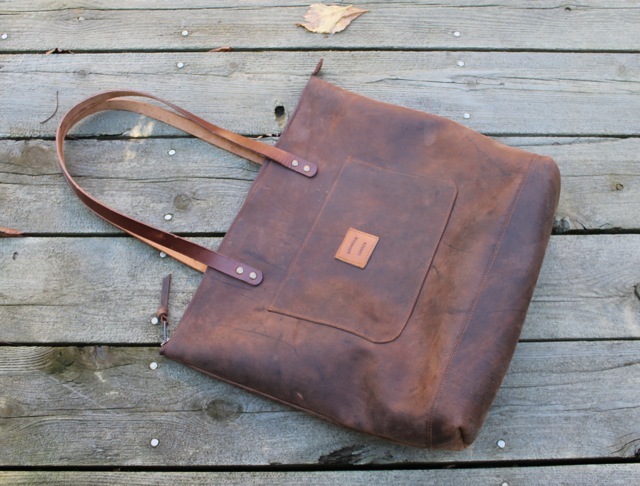 Inside it is lined with great jigsaw cotton with two additional leather pockets. In the online store now. Check under navigation on the right. I was in Toronto yesterday getting some supplies. A selection of my new bags and hooked rugs will be in a show at my favourite local gallery for the month of November and I’m working non-stop to get everything finished. I could not resist the beautiful leather remnants pictured below when I was buying zippers and rivets. They called out to me! 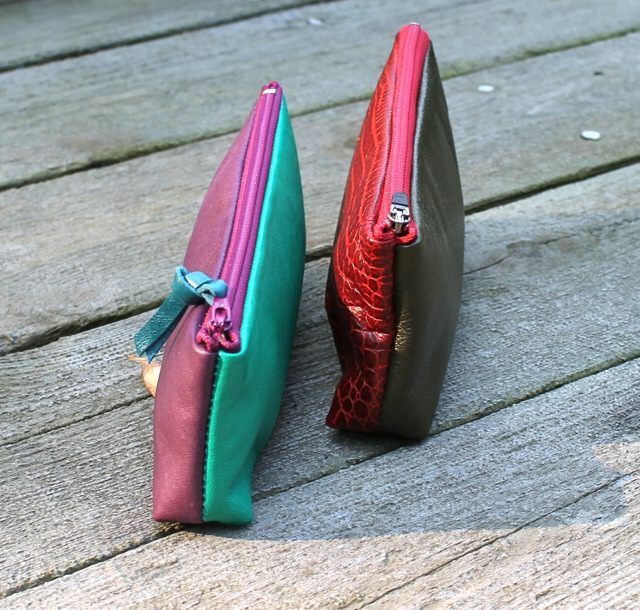 I have plans to combine the colours and turn them into small zippered pencil cases and make-up bags. I’ll be posting them here soon and some will be in the on-line store. I also wanted to let you know that I’m trying to post work in progress each day on Instagram. There is a button on the right under Navigation which will take you there. I would love if you would follow my progress. Thanks for staying with me, Christine. 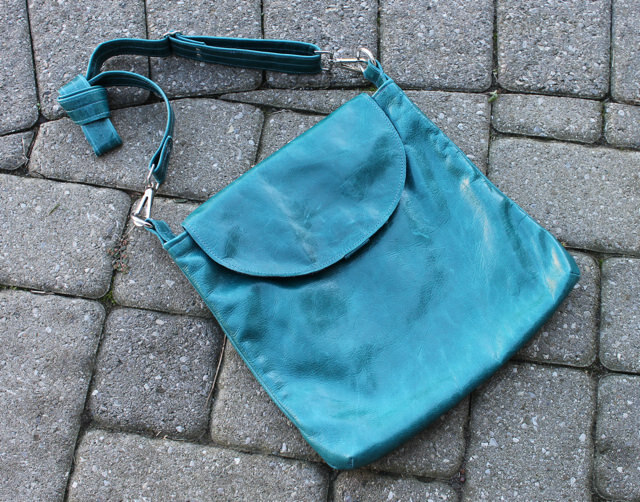 I used the same teal leather as the bag I featured in the last post–(the second photo captures this rich colour best). 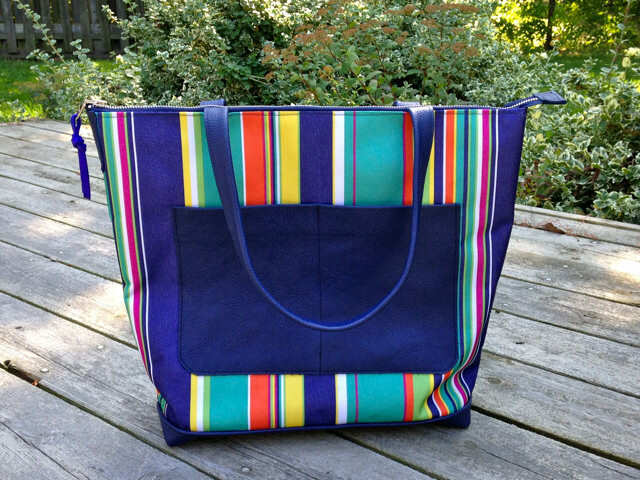 This time it is a bigger 121 bag — 12″ wide, 11″ tall with a 2″ base. It also has a flap lined in recycled pebbly black leather with a magnetic closure and a generous exterior back pocket for keys or phone. 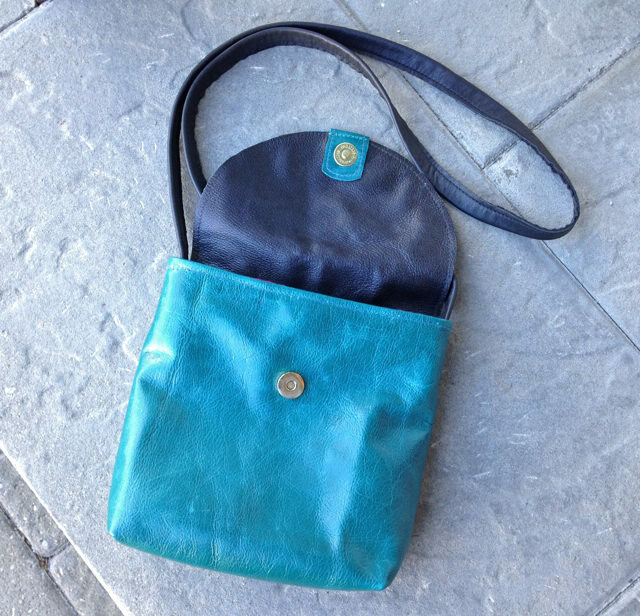 But on the bigger bag there is a wide teal leather adjustable leather strap which attaches to the bag with metal clips. Inside there are three pockets, including a zippered one for security. 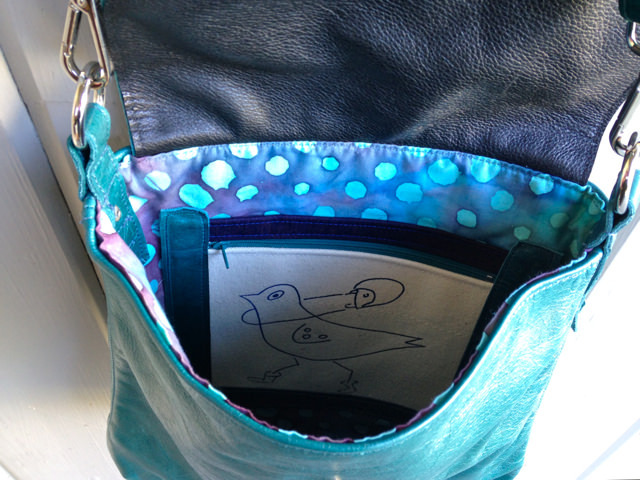 The bag is lined in great polka dot batik cotton and the pocket sports the birdbrain graphic bird in a hurry. 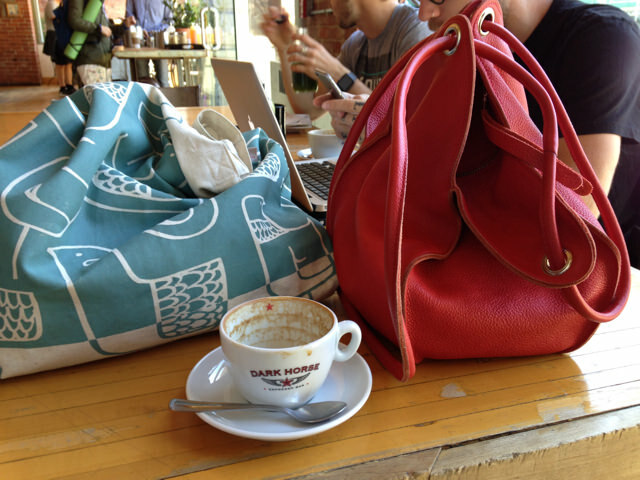 This is a great everyday bag which is generous in size for all your daily needs. I’ve been back in the studio working with some beautiful leather. The first is a deep teal blue in a perfect weight. I made the small 121 bag you see here and a larger one is on the cutting table. 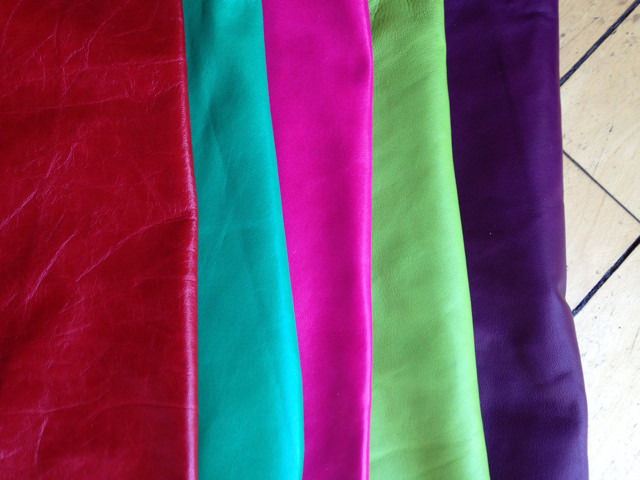 This is a perfect colour for all year round, a strong hue which fits into any palette. I may be partial on this. 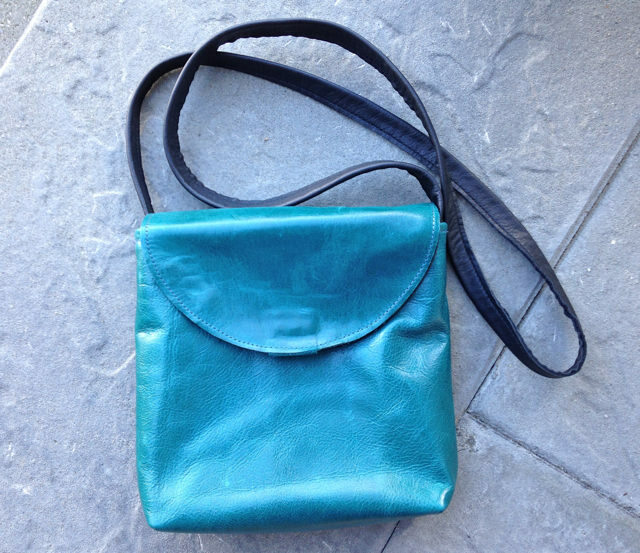 Teal blue has long been my favourite colour–and it is a hard one to find in leather. 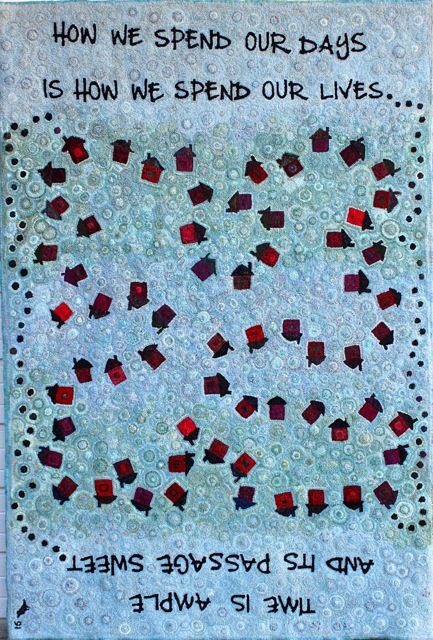 And I’ve lined it with fuschia dots–perfection! 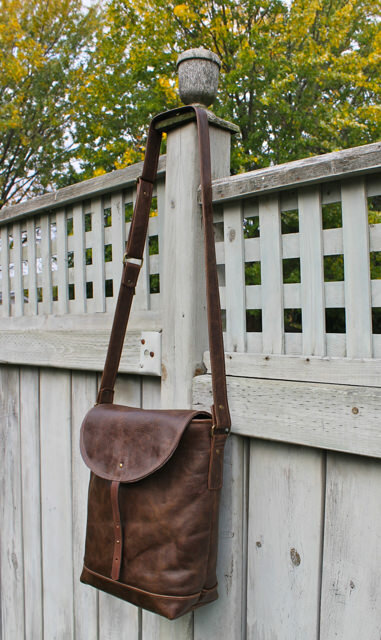 This is a small cross-body bag. 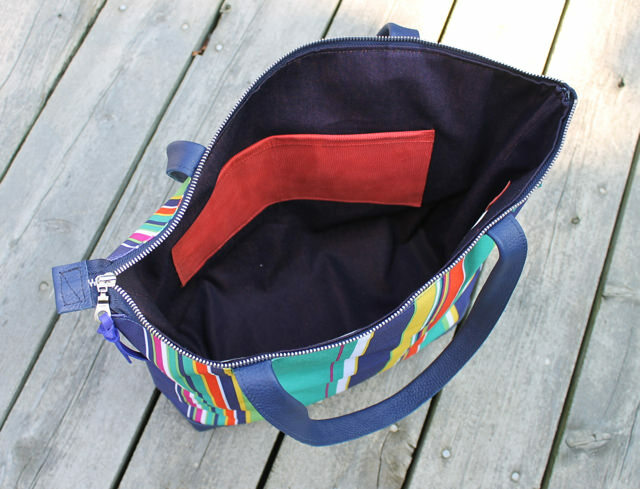 9″x7″x2″, but its roomy exterior and interior pockets are designed to hold all you need for a day in town. Here are a few pieces made in a great denim-like leather. 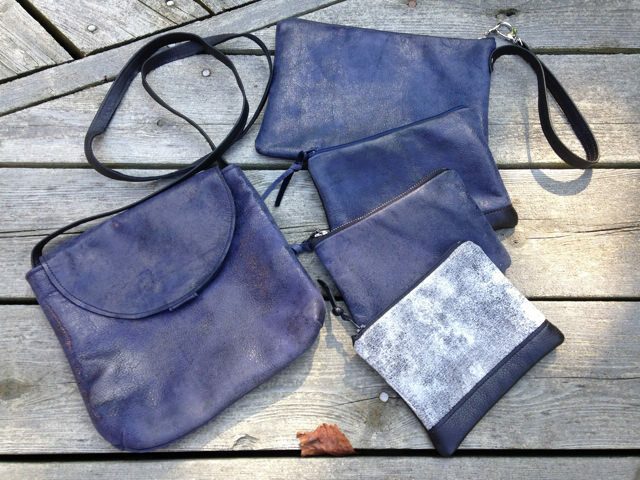 I had several small remnant pieces and was able to make one 121 bag and pouches in several sizes. They are my new favourites. I bought this material in Ireland lat year. I love its punch of colour and its durability–it has a coating which you can wipe clean. 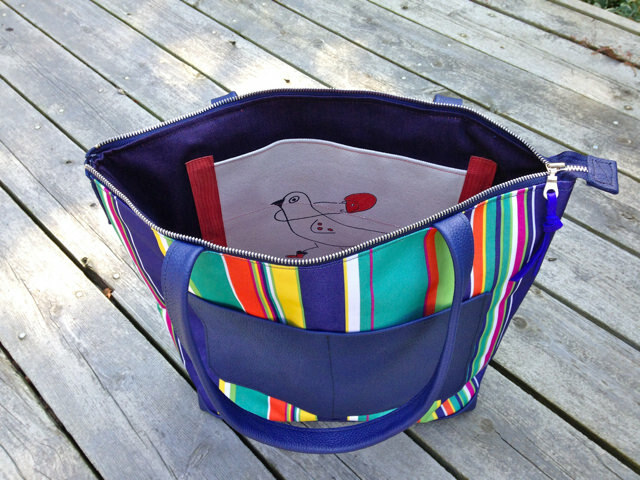 I made a smaller city tote last year and it is standing up well to the rigours of a busy life. 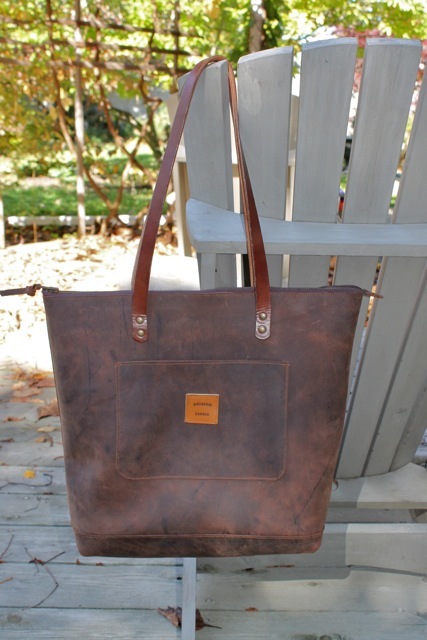 This tote measures 18″ x 15″ x 5″ and has a large double leather pocket on the outside. Inside are two more useful pockets. So it’s ready for all your toting needs. 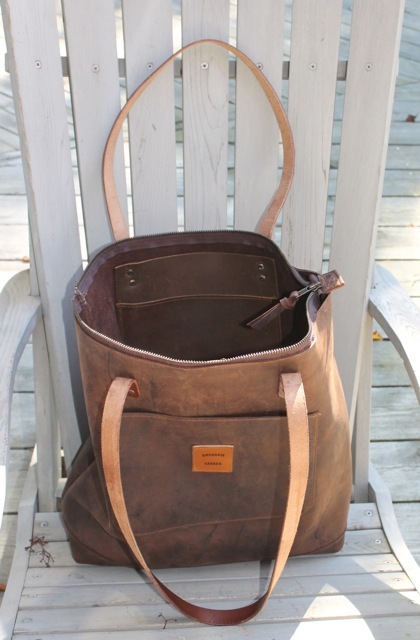 It is lined in navy denim, has leather carry handles and bottom and a durable metal zipper.